The Mobile Panflu Prep title illustrates how Kallisto can bring M-Learning content to general audiences. Kallisto used its own Kallisto Composer™, a system for developing and delivering instructional content to mobile phones. Mobile PanFlu Prep is a consumer education title developed by The Center for the Advancement of Distance Education at the UIC School of Public Health in association with Kallisto Productions, Inc. The tool using mobile phones to educate the public about pandemic flu. 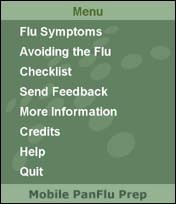 A series of menu items and audio provide the user with information on flu symptoms, advice on avoiding the flu, and a checklist to prepare for pandemic flu. 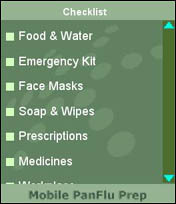 Mobile PanFlu Prep contains rich graphics, animations, voice-overs, branching, scrolling text and record-keeping. © CADE & Kallisto 2006. As a proof of concept, Kallisto developed two Mobile Health Alerts for the Center for the Advancement of Distance Education (CADE), School of Public Health, University of Illinois at Chicago. In the event of an actual emergency, members of the public could download important safety precautions to their mobile phones. An interactive presentation allows the user to answer questions and get guided advice. Reference material provides general health and safety information. © CADE & Kallisto 2005. 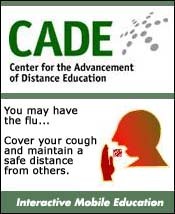 As a service to the public, the Center for the Advancement of Distance Education (CADE), School of Public Health, University of Illinois at Chicago is providing a mobile flu preparedness kit to help people prepare for an emergency. In the event of an actual emergency, members of the public could update the existing information with last minute bulletins and local references to their mobile phones. 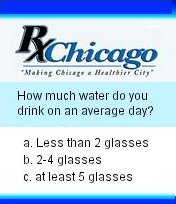 An interactive presentation allows the user to answer questions and get guided advice. Anonymous logs track the user interaction for reporting purposes. © CADE & Kallisto 2006. 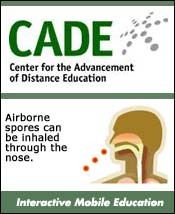 For the City of Chicago, the Center for the Advancement of Distance Education (CADE), School of Public Health, University of Illinois at Chicago, was asked to develop a self-scoring health assessment for the public. Kallisto developed the mobile application version of the survey for CADE. © CADE & Kallisto 2006.